while combing through the internet tonight, i read heather morton’s blog about ripping off other photographers and was reminded of something that happened to me. thought i’d share it. i photographed this home for dwell a number of years ago, it was a great shoot, awesome home. sent all my images to the architect so they could use them in their self-promotion. fast forward about two years, i see ad’s that look pretty darn close to my photos. turns out the architect is married to someone high up at knoll. 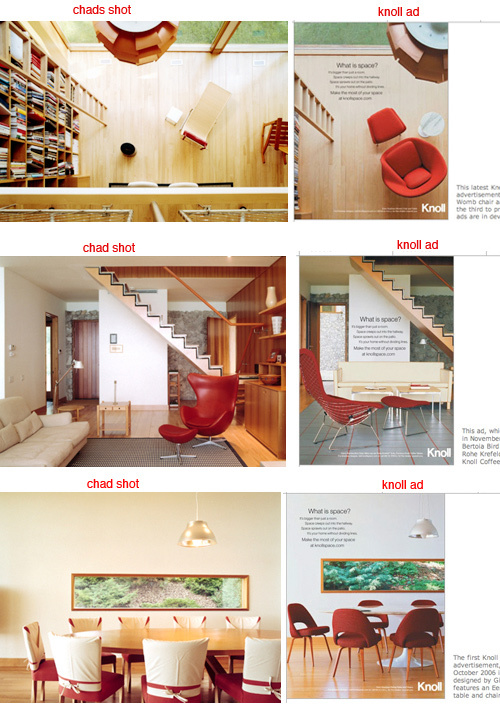 the irony was that these ad’s ran in dwell, the same publication that my images originally ran in. so who is to blame? knoll, the designer, the architect, the photographer, or nobody. do you think i got ripped off? was it just a coincidence?